Summary Entry-level single band N router with 10/100 ports based on a Broadcom N Router SoC. 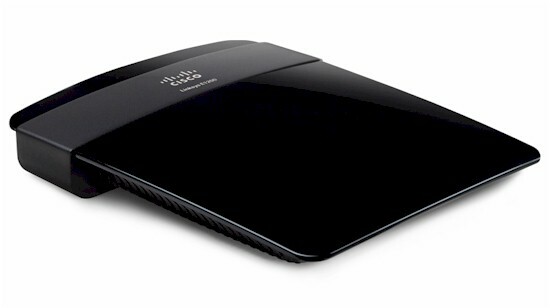 The E1200 is one step down from the previously-reviewed E1500 in Cisco's revamped Linksys router line. You can think of the E1200 as an E1500, but without the "SpeedBoost" special sauce. The only way you can tell them apart from the outside is the model number and the dark gray accent band. Like all the other new E series routers, the E1200 is designed to sit flat on a desk or shelf and doesn't have mounting slots on the bottom for wall-hanging. The single WAN and four switched LAN ports shown in the photo below are all 10/100 and there is no USB port for drive or printer sharing. Cisco is still blocking inside photos of the new E series, so I opened the test sample up after testing to snap some pix. I said in the E1500 review that I expected to find that it also uses the Broadcom BCM5357 Intensi-fi XLR 802.11n Router Solution, would have no RF can and one less antenna. The photo below shows that I was almost right, because there still was an RF shielded area. But when I pried off the top, I did not find the SiGE amplifiers that are part of the E1500's "SpeedBooster" technology. Instead there are just teeny-tiny receive / transmit RF switches. The Broadcom BCM5357 provides CPU, 10/100 WAN port, four port 10/100 switch, wireless BB/MAC and 2.4 GHz transceiver. The Winbond chip provides the same 32 MB of RAM, but the Macronix MX25L3206E flash device provides only 4 MB vs. the E1500's 8 MB. The other difference is two vs. three antennas, one of which is soldered onto the board instead of sitting in the slot near the photo top right. Routing throughput running the latest 1.0.00 build 11 firmware and our router test process measured just above 90 Mbps WAN to LAN and LAN to WAN and 117 Mbps total with up and down tests running simultaneously, essentially the same as the E1500. The IxChariot composite plot below shows upload speed around half download in the simultaneous routing test. The Maximum Simultaneous Connection test indicated support for 8K (8192) simultaneous sessions. The E1200 is Wi-Fi Certified and properly defaulted to 20 MHz bandwidth mode on power-up. I successfully ran a Wi-Fi Protected Setup (WPS) session with my Win 7 client by entering the WPS code found on the E1200's bottom label. The WPS session completed quickly and resulted in a WPA2/AES secured connection. All tests were run with this secured connection. Since I figured inquiring minds would want to know, I ran a wireless performance table comparing the E1200 with other Cisco / Linksys single band routers, i.e. the Valet M10, E1000 (which the E1200 replaces) and E1500. Highest 2.4 GHz throughput of 63 Mbps was measured using our wireless test process in Location A running uplink with the client set to Auto 20/40 mode. Running a simultaneous up and downlink test yielded 78 Mbps in the same location and condition. So running multiple clients will get you somewhat higher total throughput. Although the table shows the E1500 the winner running downlink and the E1000 for uplink, closer examination shows it's harder to call an overall winner. Running through the Performance vs. Location Plot for the four products was a bit more enlightening. One of the four plots is shown below. At least to my eye, these plots seemed to show the E1200 and E1500 generally doing better than the other two as signal levels dropped, especially in my "transition" Location D. But none of the products consistently distinguished themselves in the weak signal locations E and F.
Here are links to the other plots if you'd like to check them out. I think where I come out on all of Cisco's entry-level N routers is that they are pretty much the same. While each one might have a particular wireless performance advantage under some condition, there isn't one that clearly stands out from the pack. Put another way, I certainly wouldn't pay more for the E1500's "SpeedBooster" feature. You can further explore the E1200's performance and compare it to other products using the Router Charts. Since the E1200's feature set is well known, there will not be a full review.